YOU HAVE GOALS. WE HELP YOU ACHIEVE THEM. Are you concerned with a lifetime of medication, pharmacy visits and potential side effects? LINX is intended for patients diagnosed with reflux disease who continue to suffer symptoms despite taking medication. If this sounds like you, it may be time for LINX. ​STOP REFLUX AT ITS SOURCE. 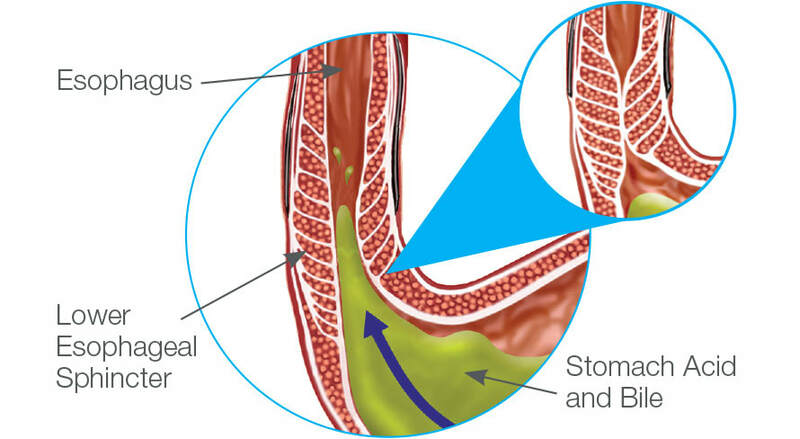 Reflux (also called Gastroesophageal Reflux Disease or GERD) is caused by a weak muscle in your esophagus called the Lower Esophageal Sphincter (LES) that allows acid and bile to flow back from the stomach into the esophagus, causing damage to the lining of the esophagus, throat and lungs. LINX is easy to understand and love because it is simple. LINX is a small, flexible ring of magnets that opens to allow food and liquid down, then closes to prevent stomach contents from moving up. Simple as that. 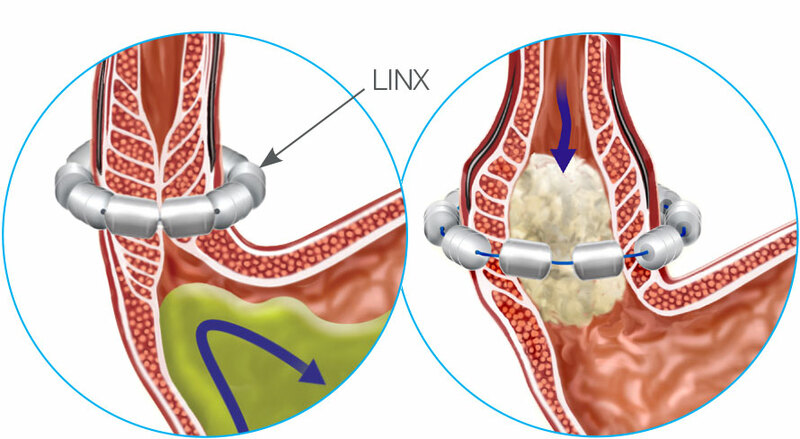 LINX® is implanted using a laparoscopic or robotic technique. This technique uses small incisions in the abdominal wall to access the area around the esophagus where the device will be placed. WHEN CAN I START EATING NORMALLY AGAIN? Patients are encouraged to return to a normal diet as quickly as tolerated. This helps the body adapt to LINX®. WHEN CAN I RETURN TO NORMAL PHYSICAL ACTIVITIES? Patients are generally able to return to non-strenuous activity within a couple of days. WILL I BE ABLE TO BELCH OR VOMIT WITH LINX®? Patients who have received LINX® have reported the ability to belch and vomit. HOW LONG WILL LINX® LAST? LINX® is designed to be a lifelong implant. The cases and wires are constructed of titanium, which has a long history of use in permanent medical implants. ​LINX® uses permanent magnets that are designed not to wear out. LINX® should not affect airport security. All patients will be provided with an implant card to have available in the event an issue arises. WILL I BE ABLE TO FEEL LINX® AFTER IT HAS BEEN IMPLANTED? A small number of patients have reported sensations in the area of LINX®. It is not known if this is the device or the result of surgery in the area. These sensations have gone away over time. There are two versions of the LINX device. One is safe in MRI scanning machines up to 0.7T, the other is safe to 1.5T. You should discuss the MRI scanning options with your doctor prior to deciding on treatment with LINX®. *LINX is prescribed by your physician. It is not for everyone. Please talk to your doctor to see if it is right for you. Your physician should discuss any potential benefits and limitations with you. Although many patients benefit from LINX, results may vary. Each patient experience is unique and does not provide any indication, guide, warranty or guarantee as to the response others will have to LINX. The response other individuals have to LINX could be different. For more information about the benefits and risks of LINX please visit www.linxforlife.com or www.toraxmedical.com. The LINX® Reflux Management System is indicated for those patients diagnosed with Gastroesophageal Reflux Disease (GERD) as defined by abnormal pH testing, and who continue to have chronic GERD symptoms despite maximum medical therapy for the treatment of reflux. Rx only. Safety and WarningsContraindications: Do not implant the LINX System in patients with suspected or known allergies to titanium, stainless steel, nickel or ferrous materials. Warnings: The LINX device is considered MR Conditional in a magnetic resonance imaging (MRI) system up to either 0.7 Tesla (0.7T) or 1.5-Tesla (1.5T), depending on the LINX model implanted. Laparoscopic placement of the LINX device is major surgery. General Precautions: The LINX device is a long-term implant for use in patients 21 years or older. Medical management of adverse reactions may include explantation and/or replacement. Potential Risks Associated with LINX System: dysphagia, stomach bloating, nausea, odynophagia, increased belching, decreased appetite, inability to belch or vomit, flatulence, early satiety, device erosion, device migration, infection, pain, and worsening of preoperative symptoms.